Conceived in 1996 as the most affordable Swiss hand-made moving coil phono cartridge, it took 5 years and a new factory to deliver the Advanced Cartridge Engineering (ACE) in 2001. Now the S Class models of the ACE SL (red), SM (clear), SH (blue) ($900 MSRP) all incorporate the Benz Micro Ridge stylus for the best performance/value ratio in phono cartridges, regardless of output level. The SL is .4mV at 3.54cm/sec with a coil impedance of 12 ohms, perfectly suited for MC phono stages with 60dB or higher gain. The SM is .8mV and 24 ohms, designed for less efficient systems and tube phono stages with gain between 45 – 58dB. The ACE SH (2.5mV at 3.54cm/sec) is among the best high output moving coils ever made, ideal for moving coil type phono stages, low-gain tube phono stages and AV systems. 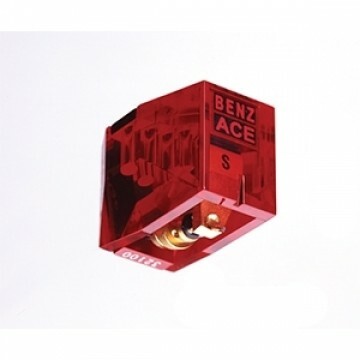 Music lovers can take advantage of industry leading programs in upgrading previous Benz Micro models or other brand cartridges to the new ACE S Class.